“Usually we would hold an announcement like this in a school,” said Nova Scotia’s Education Minister Ramona Jennex Tuesday afternoon. 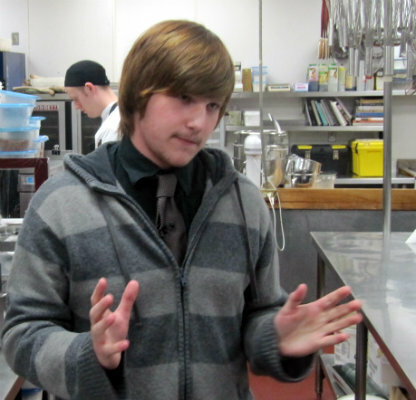 But the Department of Education announced its new Grade 9 program Discovering Opportunities at the Prince George Hotel, where Nova Scotia high school students have gained on-site job experience in the food service industry. The program, targeted at students who have trouble engaging with subjects like math and language arts, will place students in co-op work environments with participating employers. The program expands the existing Opportunities and Options (O2) for Grades 10 through 12. Wyatt Albert, a Grade 11 student participating in the O2, loved his placement in the food-service industry so much he agreed to be the poster boy for the Department of Education’s announcement. Albert, dressed in a tie and a hoodie, has discovered a passion for cuisine after preparing food in the hotel’s kitchen last year. Albert’s cooking hero is Cake Boss, an Italian cake-maker on the TLC cable network, because of the layers of art he puts into his food, he says. “I just want to keep on exploring the art of cooking. I mostly focus on different pastas right now,” he says. The new program will engage students directly out of junior high, and administrators hope to expand community involvement. “Grade 9 is a critical transition, if they’ve fallen behind in some of the traditional subjects like math and language arts,” says Jennex. The education minister will also complete a Grade 9 internal review this year examining “what [students] are being taught, how they are being taught, and how can we strengthen the links between [school], the community and the workplace,” says Jennex. Discovering Opportunities will begin in three schools this year, joining the 27 schools already in the O2 program. More than 2,000 students, after a successful interview, are accepted into the O2 work co-ops for 2013. “The program has helped me decide what I want to do, and it’s given me a chance to meet people and build my skills and knowledge in the culinary field. ” says Albert. The provincial government is also attempting to reconcile education with economic reality. This summer, Premier Darrell Dexter announced spending more than $460,000 to train young workers for the boat-building industry. No shipbuilding apprenticeships are offered through the high school program yet, but graduates receive automatic acceptance into Nova Scotia Community College — a massive leg up when the college’s waiting lists can stretch for two years. A welding class, according to a recent Chronicle Herald article, has 100 students enrolled, with 1,000 on the waiting list. Though the demand for skilled-trade workers remains high, the latest Youth Decision Survey released by the Department of Labour and Workforce Development shows that students still feel pressure to pursue post-secondary education. 60 per cent of students think their parents would prefer them to attend university above college, according to the survey. But the same report shows that more parents would prefer their children to attend college (47 per cent) than university (45 per cent). Can you publish the names of the schools that will be getting this great opportunity for their students?